It’s burger season! It’s time to fire up the grill and let our wildest burger dreams come true. We all love to pile our burgers high with all sorts of fun and delicious toppings, but too often we overlook the bun. Making your own burger buns is a great way to add more flair and flavor to your cookout! 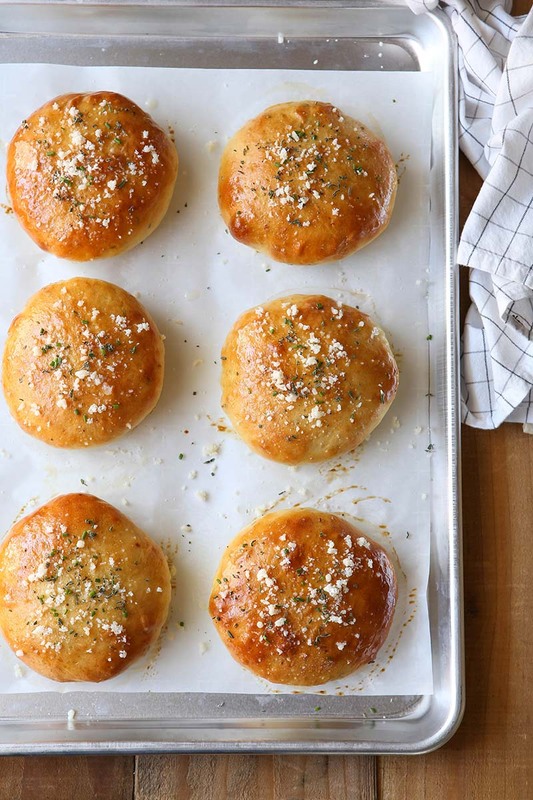 These cheesy herb buns are soft and packed with Parmesan cheese and fresh chopped herbs. 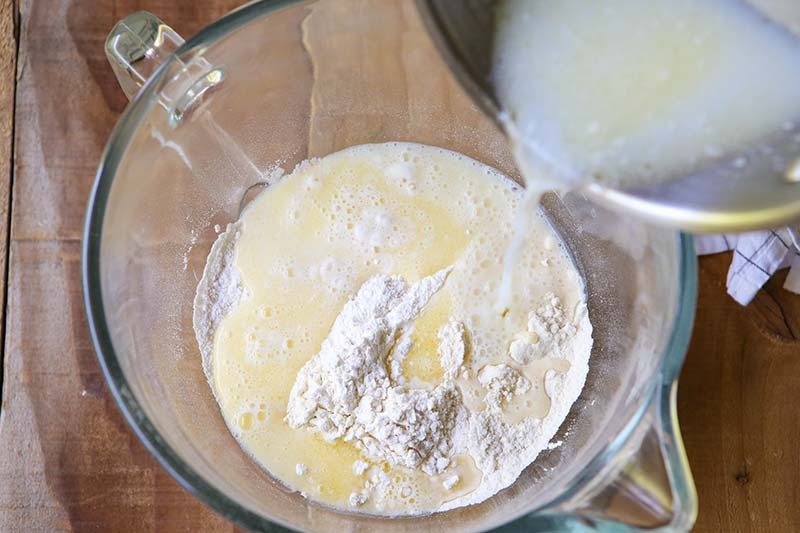 To begin, combine 2 cups of the bread flour, yeast, sugar, and salt in the bowl of a stand mixer, or in a large bowl if you plan to mix by hand. Add the water, milk, and butter to a small saucepan and warm over medium low heat to 120-130 degrees F, about 4-5 minutes. Then pour the mixture over the dry ingredients and mix until combined to make a very wet dough. Add the eggs, grated cheese, and fresh herbs. I recommend Parmesan cheese, but you can use any grated cheese you like. And for the herbs, I used a combination of rosemary, sage, thyme, and chives, but again you can use what you like. Begin kneading the dough and add the remaining bread flour 1/4 cup at a time until dough comes together into a ball and begins to clear the sides of the bowl, but is still sticky to the touch. You may not need all of the flour. Cover with plastic wrap and let the dough rise in a warm place until doubled in size, about 1 hour. 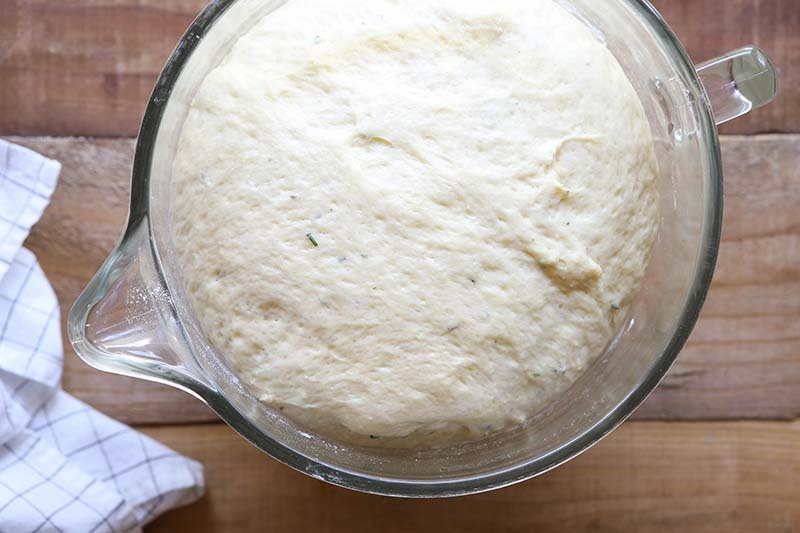 Gently punch down the dough and divide into 8 equal portions. I like to use a scale to make sure they’re all the same. Shape into round buns and place on a sheet pan lined with parchment paper or a silicone baking mat. Cover with plastic wrap and let rise until buns have doubled in size. Then brush with egg wash and bake until golden. For additional flavor and appeal, brush warm buns with melted butter and sprinkle with more cheese and fresh herbs. Making your own burger buns is a great way to add more flair and flavor to your cookout! 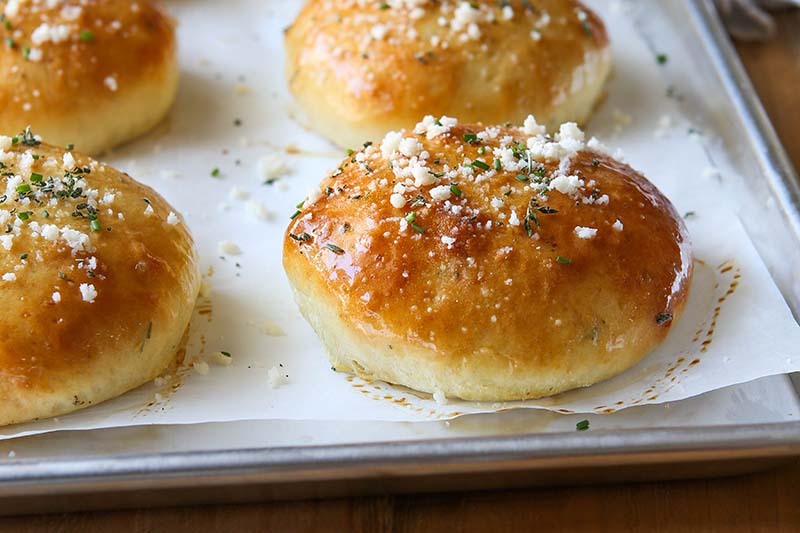 These cheesy herb buns are soft and packed with Parmesan cheese and fresh chopped herbs. Combine the water, milk, and butter in a small saucepan and warm over medium low heat to 120-130°F. 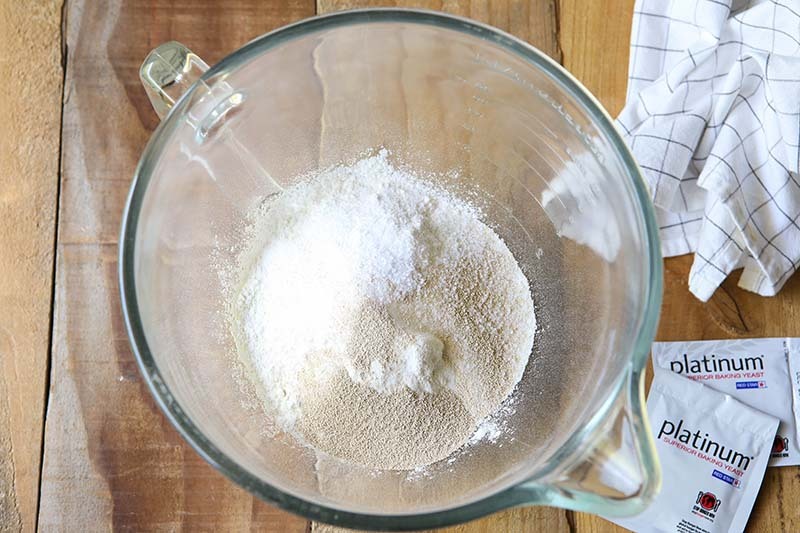 Meanwhile, combine 2 cups of the bread flour, yeast, sugar, and salt in the bowl of a stand mixer, or in a large bowl if you plan to mix by hand. Pour the warm water mixture into the bowl and stir with dough whisk or wooden spoon until combined. 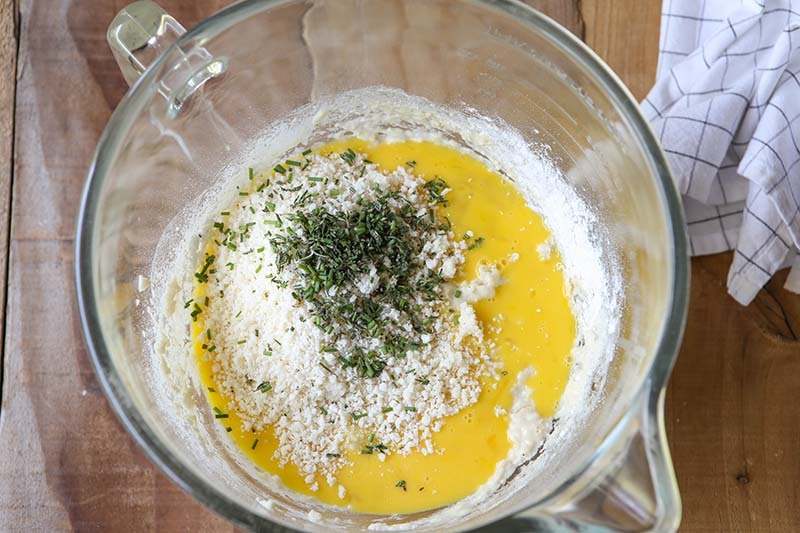 Add the beaten eggs, cheese, and herbs and stir until combined. Use dough hook to knead dough on low speed. Add the remaining flour ¼ cup at a time until dough comes together into a ball and begins to clear the sides of the bowl, but is still sticky to the touch. You may not need all of the flour. 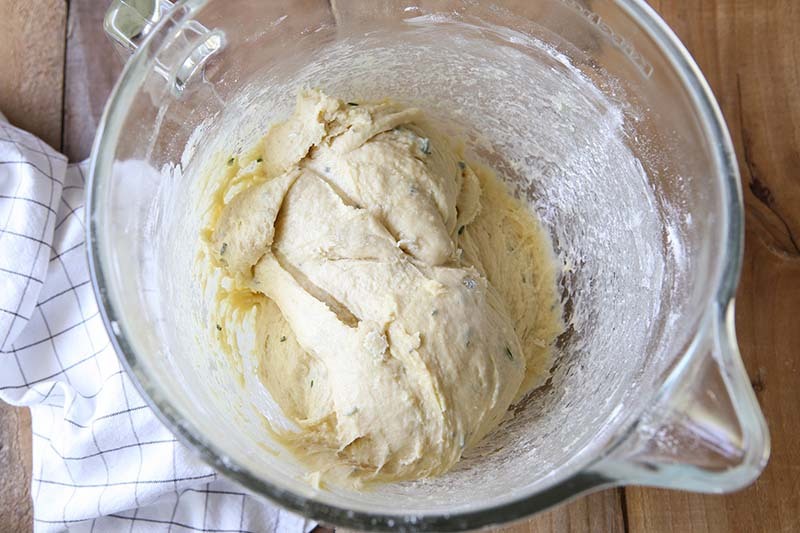 Continue to knead the dough until smooth and elastic, about 5 minutes. 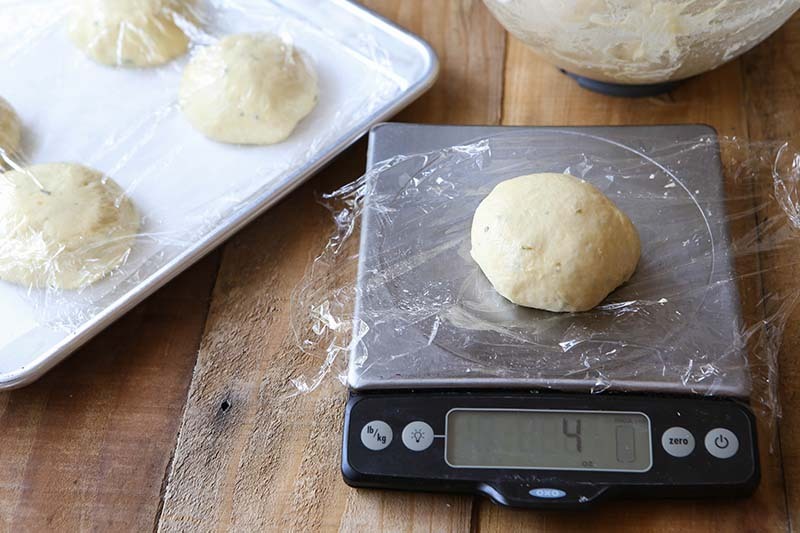 Gently punch down dough and divide into 8 equal portions. 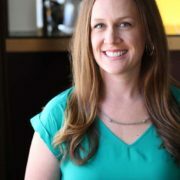 Shape into rounds and place on a sheet pan lined with parchment paper or a silicone baking mat. Cover with plastic wrap and let rise until doubled, about 30 minutes more. Once or twice while rising, gently pat the tops of the buns, encouraging them to rise laterally, giving them the look of a traditional burger bun. Be careful not to press too hard. Preheat oven to 400°F. Brush the tops of the buns with the egg wash and bake until golden, about 10-12 minutes. If desired, brush tops of the warm buns with melted butter and top with grated cheese and fresh herbs. Buns are best enjoyed the day they are baked, but will keep at room temperature for 3 days. They also freeze very well. Wrap tightly in foil and freeze for up to 1 month. Warm in a 350°F oven for 30 minutes until warm.